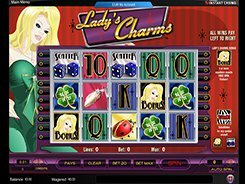 Lady’s Charms is a 5-reel 20-payline video slot themed around luxury and the accessories that are believed to bring luck to their owner. Fitting the theme, the symbols used in the game are a gold gem-encrusted clover leaf, a snow-white rabbit hat, a ruby-scattered silver key fob and other precious things as well as 10-to-A playing cards. A bet range will suit everyone’s budget as you may place starting at $0.09 and going up to $50 per spin. The slot has a wild symbol that performs its common function as a substitute for regular symbols. Furthermore, hitting five wilds on a payline awards 5000 coins which is the highest possible payout in the game. A gorgeous blonde is a bonus symbol that triggers a free spin feature should you get three or more of them anywhere. Before the bonus spins begin, you are asked to make a pick from four charms to determine the number of free spins, and then select one of four clover leafs to reveal a multiplier attached to the upcoming bonus spins. If you are a lucky one, you will be awarded 7 spins at a x6 multiplier. PLAY FOR REAL MONEY!